The Green Biohazard Survival Kukri updates the age-old design of the kukri a little bit, subtracting here and adding there to give it all the features that a survivor might want in a knife, in order to make it a more effective tool for zombie survival. Functionally a kukri in its overall shape, this knife possesses the same forward-swept blade and advanced cutting ability of its more traditional kin. Where this knife differs, though, is that instead of a blood-notch near the tip, this kukri features fine serrations, which add a saw feature to the blade that serves well the survivor in-need. Otherwise, this kukri is still up to snuff, and will cut, chop, hack, and stab with the best of them. The blade is crafted from blackened stainless steel for a tactical look, while also featuring the Biohazard symbol and logo etched onto the base of the blade. The hilt is green synthetic with a lanyard hole, to ensure that the blade is easy to handle, as well as easy to track for those with human eyes. Included with the knife is a black nylon belt sheath, for easy carrying and storing when the knife is not in use. Got a zombie you want to cut down? Done. 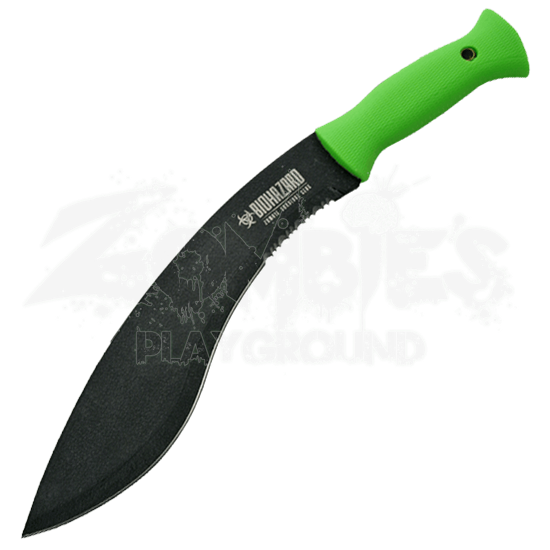 And after you cleave that walker down to size, you can start putting this Green Biohazard Survival Kukri to all sorts of other uses, too, all to ensure your survival in a hostile, zombie-eat-human world.